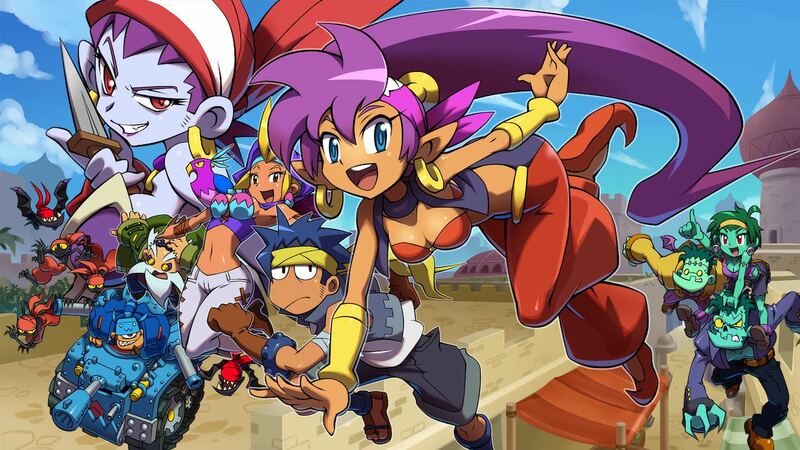 With Shantae: Half-Genie Hero being voted into Nintendo UK’s top 50 best games for the Nintendo Switch, it comes as no surprise that this critically acclaimed, pixelated prequel that was first released in 2014 has also made its way on to the system. So, if you are like me, and your journey with the belly dancing guardian first began with the latest Kickstarter-funded title, then it may be worth reading on to see whether a past adventure is still one worth venturing into. Following on from the events in Shantae: Risky’s Revenge, our Scuttle Town guardian is left without her usual animal morphing abilities. So, to keep the town safe, she now relies solely on her trademark hair whipping technique should the lively little Arabic-inspired community fall under attack again. Of course, it all eventually does go pear-shaped, thanks to the stupid decisions and deals made by the hapless Mayor Scuttlebuck. This leads to the half-genie hero at risk of losing her precious purple locks for the sake of doing her duty. However, this is far from the biggest problem to shadow over Sequin Land, as a deceased pirate is about to make a dreaded return to the world. On top of that, he happens to be so evil it’s even got Shantae’s main antagonist, Risky Boots, very concerned. While the story is enough to give an outlined rhythm to the adventure, it’s the context stitching it all together that really buffs up the narrative. Everything is written with a certain charming wit that is both funny and clever as you interact with the cast of characters scattered around you. Take the loitering, self-pitying Squid Baron, for example, fed up with his purpose in life after coming to terms with being nothing more than a filler boss from the previous game. Sure, there are nods here to cater to those who have played the series in sequence, but it’s all portrayed easily enough to understand without needing to know the background events beforehand. A witty plot is nothing without gameplay of course, so it’s a good job that developer Wayforward understands exactly what it takes to make a good puzzle-platformer. The new abilities and progressive upgrading system ensure that the Metroidvania element doesn’t go unrewarded, while the tight controls and diverse situations keep the gameplay feeling constantly fresh and responsive. There are nods here from many classic titles, with Ghouls ‘n Ghosts style landscapes, Mega Man-type encounters and, of course, Metroid-esque exploration. Even the dungeons have a sort of 2D The Legend of Zelda puzzle feel to them, and while these can seem cherry-picked from the work of others, in execution, they are so expertly crafted that they all work seamlessly well together for the most part. Despite no longer having access to her animal dance forms, Shantae now relies on equipment belonging to her arch nemesis Risky Boots, who happens to have formed an unlikely alliance with our protagonist in order to take down the resurrecting pirate. These abilities can give you aggressive and navigational advantages that will not only help you in challenging situations but will also become useful to reach previously unreachable areas. Funnily enough, I actually preferred these abilities over the animal forms from her latest adventure, mainly due to being able to use them as an instant button action, as opposed to the way the animal dances were handled. There were a few elements to Shantae and the Pirate’s Curse that I did find a bit frustrating though, most notably with the save system. When you die, you are sent directly back to your last save point. This is fine and dandy in the sense that death does not go unpunished. The problem that I found was that anything in between also doesn’t automatically save. This can create a bit of a headache, especially if you beat a difficult boss and forget to go back into the temple to save your progress, which forces you to face it again should you die on your way back to a save room. Another little gripe that I had was that it isn’t always clear on where you have to go to next. This can sometimes lead you to aimlessly replaying areas in the hope of bumping into something to move things forward. It makes replaying levels that you know you are going to revisit several times a bit more of a chore than it really needs to be. Visually, the pixel art that fills the screen is outright gorgeous. It may not have the gloss of Shantae: Half-Genie Hero, but there are some great animations that work excellently along with a nice blend of colours. The music is also top notch, constantly tempting me to bop along with Shantae with its bouncy, catchy tracks. The added HD Rumble support works particularly well too, along with a little Nintendo Switch exclusive minigame that can earn you more currency if your reactions are good enough. If you enjoyed Shantae: Half-Genie Hero, then chances are that you will take to this with a similar embrace. For those that have never played a Shantae game, it’s easy enough to get to grips with without knowledge of the series. On the whole, Shantae and the Pirate’s Curse is a stylish and fun 2D platformer that fits as well, if not better, than it does on the Wii U and Nintendo 3DS. Some of the backtracking may be a bit tedious for some and the save system in particular is less than desirable. These are only small criticisms in the grand scheme of things though because Shantae and the Pirate’s Curse as a whole is an absolute joy to play.